There are no second acts in American lives.” This famous quote from author F. Scott Fitzgerald buzzed in my head as I arrived at Old Port Marina in North Palm Beach, Florida, ready to board Friendship, a new Hinckley Picnic Boat MKIII. 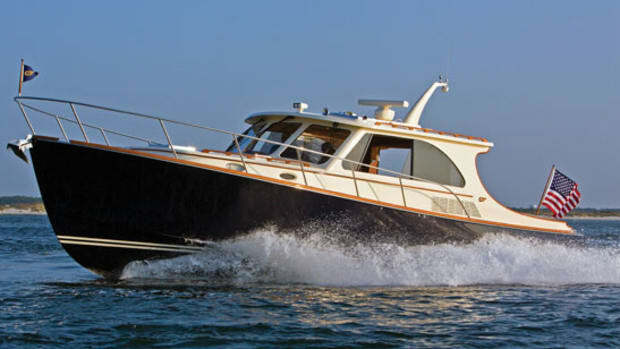 The 37-footer, a redesign, represented a second act of sorts for Hinckley, which defined the category when it launched its original 36-foot picnic boat in 1994. There are no second acts in American lives.” This famous quote from author F. Scott Fitzgerald buzzed in my head as I arrived at Old Port Marina in North Palm Beach, Florida, ready to board Friendship, a new Hinckley Picnic Boat MKIII. 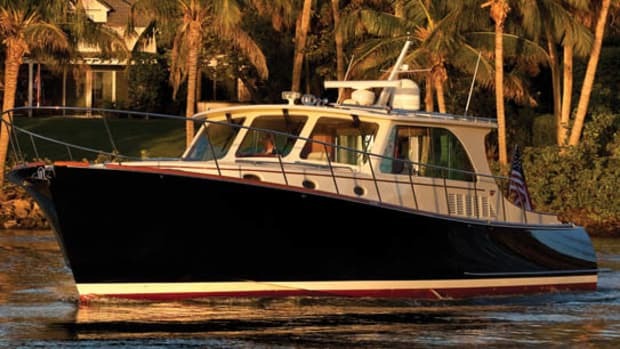 The 37-footer, a redesign, represented a second act of sorts for Hinckley, which defined the category when it launched its original 36-foot picnic boat in 1994. Making major changes to a classic is a bold move, and before laying eyes on Friendship I had to wonder, was Fitzgerald right? Hinckley would respond no. The company says that despite making its debut in the midst of this recession, the MKIII is its most successful new model ever. 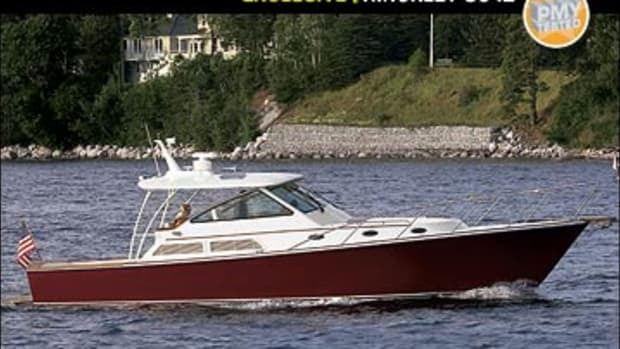 Hinckley based its changes not on whim, but on feedback from its customers and sales staff to improve the original picnic boat concept, presenting a final design that looks, handles, and performs better than the old one. Still, I had to find out for myself. 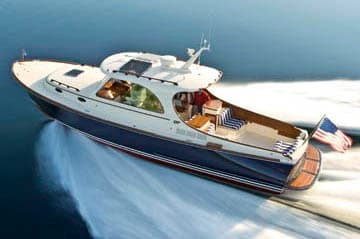 As I approached Friendship from the dock with Eric Champlin, senior sales director at Hinckley Yachts, she already commanded my full attention, with her teak trim, mirror-like blue gelcoat, and classic tumblehome. Yeah, she’d be right at home in Fitzgerald’s The Great Gatsby. The MKIII certainly looks like the original, and she serves the same purpose, but in layout and design she is an entirely different animal. Start with the fact that the first picnic boat carried a single 315-hp engine. 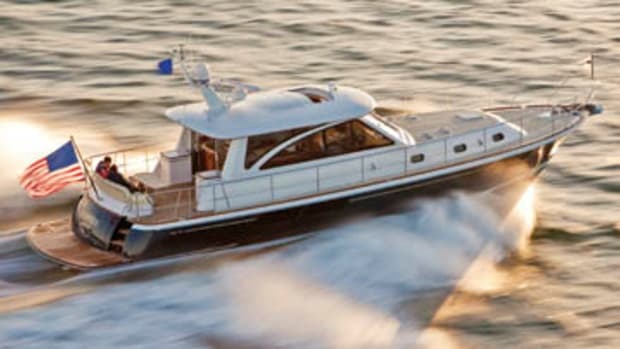 The latest version employs two: twin 300-mhp Volvo Penta D4 diesels. 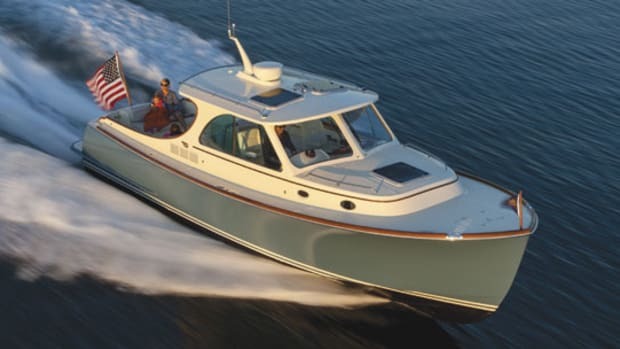 Owners had been asking for more horsepower, and Hinckley obliged on the old version to a point, running a single 435-hp diesel on some models. The single-engine configuration meant the engine and waterjet had to be mounted along the centerline, and the boat needed a flatter running surface to climb onto and stay up on plane. Newer, lighter diesels are what allowed Hinckley to use twins and bring the total horsepower to 600. My test boat’s new hull design, by architect Michael Peters, deepened the V from 15 degrees of deadrise at the transom to 19 degrees. The new hull is dryer with better seakeeping abilities. 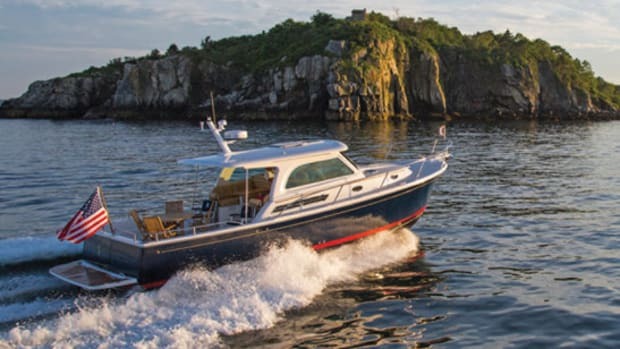 “She’s got the capabilities with the twin engines and more deadrise to be a more serious offshore boat,” explains Champlin. Peters also added four inches to the LOA and 1&apos;3" to the beam (36&apos;11"x 11&apos;3"). The extra engine and jet drive, combined with the larger build, increase the dry weight by 5,500 pounds. Hopping onboard, the side-entry drop steps immediately caught my attention. They fold down from their recessed points in the teak coaming boards and line up with the teak grabrails on the hardtop so you have a handhold as you board. Friendship’s optional teak decking gave her the air of a classic, as it did on the old models. The twin Hamilton waterjets reside under the cockpit; an in-sole hatch provides access. The buckets and nozzles, which control direction, hide under the standard swim platform. That means there is no running gear underneath the hull, giving this 37-footer a skinny draft of just 2&apos;1" (seven inches deeper than her predecessor), easing some of the worry associated with close-quarters boating. 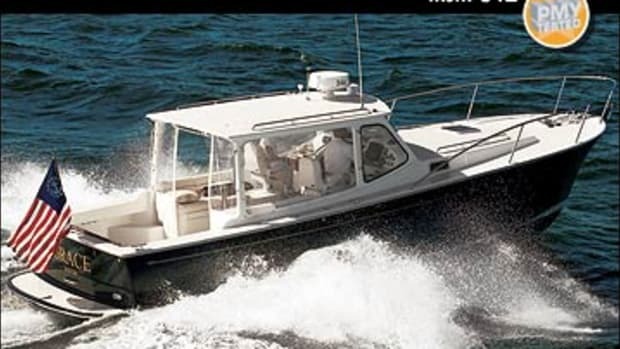 The powerplants sit directly under the pilothouse with 110-gallon fuel tanks mounted outboard on either side. The original tanks held 83 gallons each, but extra fuel was needed to compensate for the added weight and horsepower and to keep the cruising range at more than 200 NM. Walking up the single step into the pilothouse gave me an even greater appreciation of this latest incarnation. The first thing I noticed is how much you can actually see. For an enclosed helm it felt airy and open, no matter where I sat. 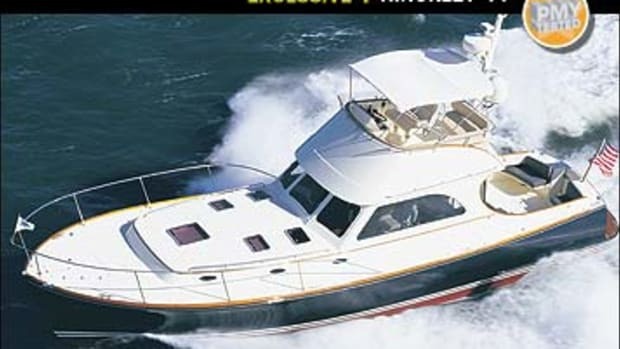 Hinckley owners wanted the person at the helm to feel more connected to the outdoors, and the deeper V allowed the builder to raise the pilothouse without making the 37’s lines too tall and boxy, giving passengers 6&apos;5" headroom under the hardtop and a higher vantage point. “We worked very hard on the sightlines so that not only the helmsman but all passengers have visibility from the pilothouse,” says Champlin as we sit on opposing settees, a layout change from the L-shape lounge to port on the old models. Another noticeable change is that the engines are completely below decks, rather than housed in an engine box. The single engine sat partly under the old L-lounge and extended aft into the cockpit, eating into open space. Now, engine access is through a small hatch in the deck to check the fuel filters and basics; the entire deck lifts on an electric hatch for service access. Much of my test boat’s open feel came from the overhead hatches and side windows that slide open with the push of a button. These power windows slide back and then inside the aft fixed piece, opening twice as wide as the earlier manually operated windows. The new glass sits on a durable stainless steel track, an upgrade from the previous aluminum frames. Additional light shines down from the 32" x 32" Man Ship hatches overhead, which are more than twice the size of the old picnic boat’s hatches. They, too, are power-actuated, with sturdy dual cylinders that hold them steady even when they’re open underway. And when open, the hatches funnel fresh air directly to the captain and passenger in the standard Stidd pedestal seats. Each seat has its own hatch and window controls, plus separate air-conditioning vents in the inwales and controls on the dash if the fresh air isn’t doing the job. It’s like dual-zone climate control in a car. I exited the voluminous pilothouse, took two steps down into the cabin, and noticed something else: I could stand up straight. The new design added four inches to the total cabin headroom, now 6&apos;3". That’s key for taking a shower in the head to starboard, for prepping a meal at the port-side galley, or for overnighting. Both above and below decks, Friendship showed she’s more evolved than her picnic predecessors, but she shares one constant with the rest of the Hinckley family—the JetStick control. I grew up as part of the Atari generation, so manipulating a joystick is nothing new. Nor is operating a boat with one, having experienced it firsthand with pod drives, inboards, and stern drives. But this was my first time using my fingertips to drive a jetboat. I had to clear my head of my previous jet-powered experiences—personal watercraft, flat-bottomed river skiffs, and flighty runabouts. The popular wisdom is that jet-powered boats have no steerage at slow speeds. At the helm of the Hinckley MKIII, that notion couldn’t be more off base. The Hamilton waterjets are nothing more than big water pumps connected to diesel engines. They pick up water at high volume, low pressure and discharge it at low volume, high pressure, creating thrust. Semi-circular buckets downstream of the jet nozzles move up and down for forward and reverse while the nozzles themselves pivot side to side to alter direction. The buckets are synched so they respond in unison when you move the joystick. Hinckley’s patented JetStick control has three modes: Docking Mode that adds the use of a hydraulic bow thruster for close quarters handling, Power Steer Mode that allows for total joystick control underway, and Helm Mode that provides for more conventional steering with the wheel. Getting started, I had to disabuse myself of the need to grab the wheel and work the throttle levers in forward and reverse. To go reverse, you leave the throttle levers in forward and pull the joystick back. Once I got the hang of it, I realized that in close quarters the MKIII has a feature no other boat can match: brakes. Sure, prop boats will stop if you throw back the throttles, but the sensation is anything but smooth. With waterjets, the engines don’t have gears—the buckets control forward and reverse, not the transmission. So the engines maintain smooth operation while the buckets change the flow direction. The jets are so responsive in docking mode that I moved the joystick in reverse, and Friendship came to a near dead stop. I could spin her on her axis, crab sideways with the thruster, and hold position with almost no effort. Underway, I had flashbacks to the classic Atari game “Tank Commander,” navigating through a crowded Intracoastal Waterway at 20 knots with a slight twist of my fingers. The deeper V helped the boat track straight and execute lock-to-lock turns at wide-open with no blowout or slippage. We handled several large wakes from fast-moving sportfishermen; the only time we took spray on the windshield was when I hit a rolling three-footer head-on at WOT. I brought Friendship back to Old Port Marina in Helm Mode, getting a feel for how she steered with the wheel. She did just fine, tracking as straight as any prop boat I’ve driven. In many ways the MKIII is exactly the same as the original Picnic Boat, built with the same SCRIMP Kevlar and Carbon composite hull with vinylester resin. But all the changes are for the better. No second acts? In this case, F. Scott Fitzgerald, you were dead wrong. 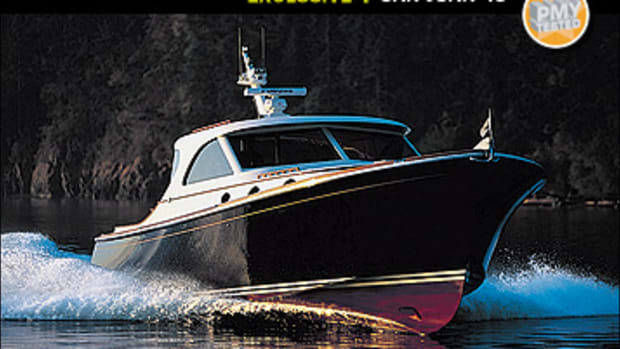 This article originally appeared in the May 2010 issue of Power & Motoryacht magazine.